Each movie of Wong Kar-Wai reminds me of what Jean-Luc Godard once said during an interview with Youssef Ishaghpour: “…cinema is much more the image of the century in all its aspects than some little novel; it’s the century’s metaphor.” True enough! Despite their pessimism and sad endings, Kar-Wai’s movies always bud out as sanguine metaphors to this age. Wong Kar-Wai’s feature films are prolific visualization of temporality of feelings and of life in general. Hence, he has rightly earned himself the title of ‘auteur of time’. He is a Chinese director from Hong Kong, who began his career in film-making with his directorial debut, As Tears Go By, in 1988. Since then Kar-Wai’s experiences and observations of the degenerating culture in postcolonial Hong Kong have made their implicit presence in all of his movies. When Kar-Wai moved with his parents from Shanghai to Hong Kong in 1963, Hong Kong was already weighed down by three cultures: the Chinese, British and Japanese. Sandwiched between their cultures and their military claim over Hong Kong as their territory, the natives of Hong Kong underwent no better treatment than that of homeless refugees in their own land and elsewhere, if and when they managed to escape. As it appears, there are so many Hong Kongs in the world today. In the delusion of liquefying national boundaries for a progress towards transnationalism, time has more often than not replicated itself. While transnationalism is the dictate of the present world order, people who follow this dictate beyond the virtual space are normally treated as migrants and refugees. What a paradox that when the word ‘home’ strikes home, it leaves only an apparition of things lost or never gained: stability, security, memories and, above all, love. Ever so subtly, with a diligent play of colours, facial expressions and moving monologues, Kar-Wai brings home the anguish of homelessness with acute finesse, thereby kindling unwonted emotions even in those of us, who wallow in the feeling of having a home. In his movie, Days of Being Wild (1990), we see the male protagonist Yuddy (Leslie Cheung) wasting away his life because he could never regain his trust in the world once broken by his Filipino mother, who abandoned him at his birth. Similar is the case with the protagonist of his movie, 2046 (2004), where, having lost the only chance of seizing a home for himself, Chow Mo-wan (Tony Leung) moves from one country to another in search of something that doesn’t change. In the movie, In the Mood for Love (2000), Su Li-zhen (Maggie Cheung) and Chow Mo-wan (Tony Leung) find comfort in each other, when they discover that their spouses are having an affair. However, pained from being jilted and, further, accursed by a heavy conscience for proceeding towards an extra-marital affair themselves, they decide to part. Chungking Express (1994) and Fallen Angels (1995) are Kar-Wai’s attempts at sketching the precincts of Hong-Kong noir, showcasing the utter anarchy of a rootless culture affecting relationships irremediably. Happy Together (1997) is a beautiful saga of gay love, where Ho Po-wing (Leslie Cheung) and Lai Yiu-fai (Tony Leung) migrate to Argentina from Hong-Kong to revive their passionate relation. Ho Po-wing chooses to remain a hedonist and, as a result, they fail to restore faith in their love. Two of Kar-Wai’s feature films – Ashes of Time (1994) and The Grandfather (2013) – are martial arts drama movies. Besides the aforementioned movies, Kar-Wai also directed a few short films and an English picture, My Blueberry Nights. Although In the Mood for Love is considered a cult movie and is canonical to modern cinema, for me Ashes of Time is Kar-Wai’s masterpiece. The movie not only is at its best cinematographically, it is also the only movie which resonate of a different period in human history, a far call from the modern and postmodern period and yet effectively conveys the timeless message: humans have always been nomads; their journey, a perpetual longing for a home. Wong Kar-Wai’s exemplary story-telling also becomes prominent in the way he connects Days of Being Wild, In the Mood for Love and 2046. The end shot of Days, which is completely disconnected to the movie, forms an epilogue to Mood for Love and proceeds towards 2046 in an equally mysterious manner, where we find the convergence of most of the characters from all the three movies but only as chance encounters. By the end of the trilogy, they are what they were: alone. References to the inevitability of change are often made in his movies. In one sequence of shots in 2046, Chow is seen trying to change the tragic end to his story ‘2046’ but the nib of his pen fails to touch the paper for more than five nights. This is one of Kar-Wai’s philosophically most sublime imageries and in this one freeze frame shot Wai manages to sum up figuratively the crux of all his movies: that of the irreversibility of events in our life. In a similar note, in Chungking Express, we hear cop 223 (Takeshi Kaneshiro) asking himself quite dejectedly if anything doesn’t expire in this world, while sitting on the stairs of a supermarket and, finally, realizing that his relationship with his lover expired months ago. The precursors of cinema like Godard, Resnais and Kieslowski had already set high standards for films on historical nostalgia. Although unachievable for novice directors, Kar-Wai did achieve these standards in a short time. 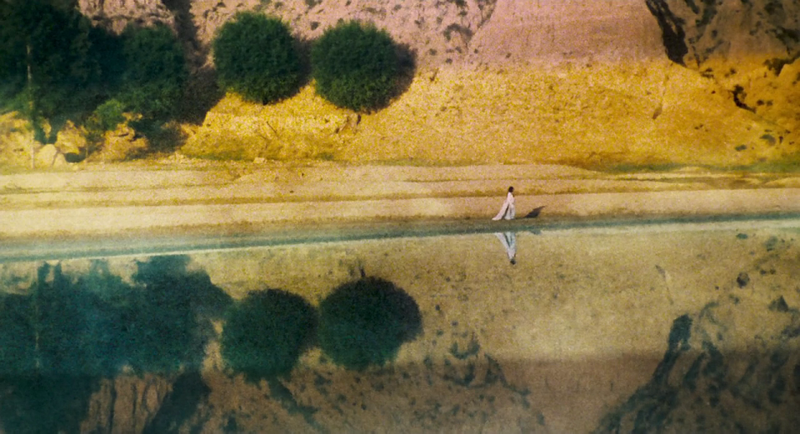 If Resnais’s Hiroshima Mon Amour is poetry in black and white, then Kar-Wai’s Ashes of Time is poetry in colours and both the movies are equally unparalleled in the history of cinema. Regardless of the influences, Kar-Wai succeeded in establishing a style, which is quintessentially his own. Clocks, corridors, trains, bird cages, reflections in water and mirrors, change of seasons, smoke from burning cigarettes are some of the tropes that Kar-Wai employs to illustrate man’s ephemeral existence and its entrapment in memories; for if not for memories there wouldn’t have been any misery in this world. Once in a while we even come across a monologue or a dialogue which expresses the need to part with memories. His movies are at all times a question in disguise: can homeless people afford to have memories? In addition to his symbolism, he makes frequent references to eastern mysticism and folklores. For instance, in Days of Being Wild, he more than once refers to a bird which cannot fly; in Happy Together, the Iguazu Falls, being the destination of the gay pair, appear time and again hinting at the possible sad climax of lost love, associating the sadness with the history of the Iguazu Falls; in Ashes of Time, excerpts from the Chinese astrological almanac are in abundance and, in 2046, Chow Mo-wan is often heard repeating the ancient way of keeping a secret to oneself, that is, by making a hole in a tree, whispering the secret in it and then filling up the hole. In fact, the origin of Chow’s fixation with keeping a secret to oneself begins in In the Mood for Love itself. Likewise, music too is fundamental to his movies. Music enters wherever speech and sounds fail to capture the poignancy or the nostalgia of a moment and such moments abound in his movies. Hence, it’s no wonder that despite casting Cantonese pop stars in leading roles in his movies, Kar-Wai seldom resorts to Cantopop, preferring to use a variety of music, generally slow and soothing to fall in with his signature shot style: slow motion and long takes. Music also bridges shots of two or more of his movies, without any verbal reference to their connection. For instance, the soundtrack, ‘Jungle Drums’, which we hear in Days of Being Wild while Tide (Andy Lau) waits near the telephone booth for Su Li-zhen’s call, is again heard in 2046, when Chow Mo-wan meets Lulu (Carina Lau) in a pub. Wong Kar-Wai’s virtuosity in film-making emerges from the way he uses his shots to penetrate the psyche of his viewers. While slow motion, long takes and close-up scenes infuse in us the sorrow we see in the life of the characters, his montage ranges in intentional jump-cuts with over the shoulder shots, which tirelessly play with our own emotions, prompting us to question them. Commingled with fragmented narrative in now flowy, now sharp monologues and submerged in prismatic colours, all of them: the shot, the monologue, the colours fade into each other with ease, establishing a matchless style in the world of modern cinema. Dreamlike and sensuous, these shots inch their way across our consciousness and linger till we are reminded of similar moments in our life where we had to choose between two or more roads; of thoughts and feelings left unexpressed; of chance encounters and absences and indefinite longing for stability. Of course, Wai doesn’t take all the credit for the best of his movies; some of it goes to the widely acclaimed Australian cinematographer Christopher Doyle. It is with Doyle that Kar-Wai managed to bring such astonishing visual excellence to his movies. One look at the scene of Iguazu Falls in Happy Together and it’s evident why cinematographers and musicians, besides the director, play significant roles in the success of a movie. Commercial cinema definitely has a way with pleasing our senses but they often leave our souls thirsting for aesthetic experience. Alternatively, a continuous dose of art cinema might be crushing for a new cinephile’s delicate disposition. To such dilemmas, we have solutions in directors like Wong Kar-Wai. His movies are without genre or, rather, they are ambitious multi-genre projects. They also forge a healthy measure of aesthetic experience, insightful entertainment and a lot of wisdom, without ever being overtly suggestive.